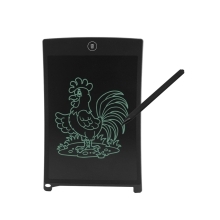 The 8.5inch LCD writing tablet is a perfect replacement for paper and pen, it can be reused for thousand times. Pressure-sensitive writing surface, you can simply draw with fingernail; Sent with a stylus pen. Press to erase the written content, fast and convenient. The CR2016 battery can last for 2years and is replaceable. 4.5mm ultra-thin and lightweight: portable to carry; Deaf people can communicate easier. Can be used for class note, draft and memo pad, a great helper for children, student, business people, designer, engineers, teacher, & etc. Item Size: 21.9 * 13.8 * 0.45cm / 8.6 * 5.4 * 0.2"
Package Size: 22.5 * 14.8 * 0.7cm / 8.8 * 5.8 * 0.3"